All the way back on the 26th of June 2011 Jimjimany won the White Isle Star Bowl. His prize was a team of his choice painted by me and he decided to go for Chaos Pact. I have already made mention of this team in earlier blogs covering my thought process of sourcing and converting the team. But I have finally started putting paint to plastic and metal and have some results to show. As I had gone for a 2nd edition vibe with the Marauders I decided to do the same with the 3 renegades. I already had some goblins and skaven left over from the underworld team so it was just a case of getting a Dark Elf. With 7 different races all with different skin, hair and uniform styles I went for a simple and classic chaos colour scheme to help tie them together. The armour was black armour with gold edging and silver metallic parts, whilst any cloth was bone and to add a little colour some models had red bits added. 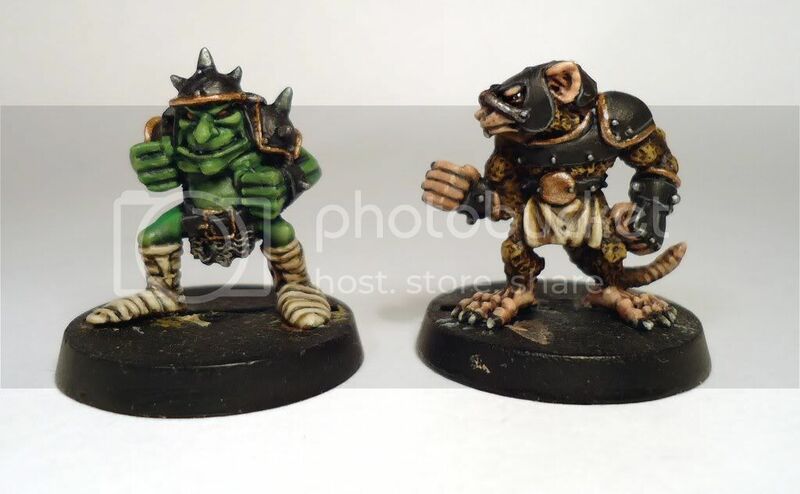 Here are the skaven and goblin, I wanted to keep the armour true black so went for minimal highlights around the edges, otherwise it ends up looking too grey. These 2 models were both very simple as they had no extra details on them. Originally I was going to paint all the trousers bone, but the Dark elf's chest armour looked too much like a skull to paint it black. Both him and the marauder have a small area of red that adds a little colour. I just noticed form this pic that I forgot to paint the studs on the trousers of the Dark Elf so will have to correct that. 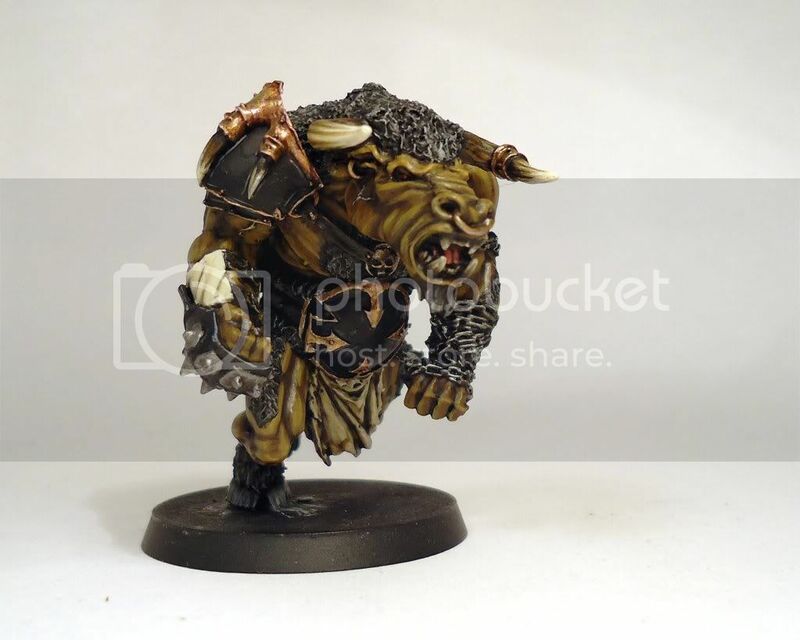 Jimjimany wanted the minotaur to be a model done by Avatars of war, I am a real fan of their stuff and it is a very cool model. It needed minimal conversion as all I had to do was cut off the ball and chain and swap his axe arm for a glove from an ogre. He is rather unbalanced and heavy so I am a little worried about him continually falling over and chipping his face so he may need some extra weight at the back. His colour scheme was very simple as he is mostly skin and hair. That is not all I have been working on, this year the White Isle Star Bowl III will be taking place on September 22/23. 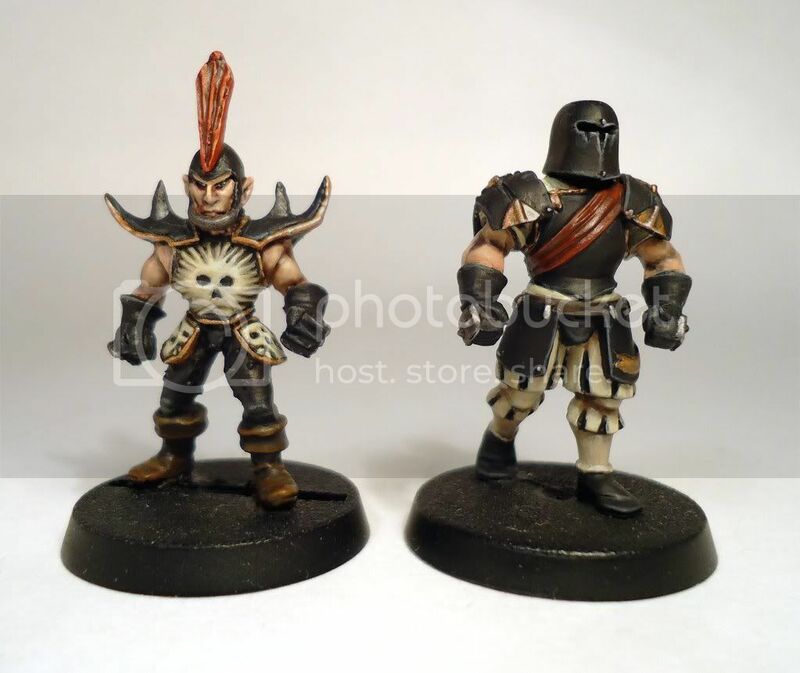 This time I am going to be painting up a team beforehand and I wanted to do a team I had not done before. This left me with Goblins, Halflings, Ogres. Pro Elfs, Slann or Vampires. I was considering doing Pro Elfs using either the original design for the amazons I did for Kalimar as they work as pro elfs, amazons or even humans or high elves or possibly a team made from the 2nd edition Elf models. But a discussion on TFF gave me the inspiration to start a slann team. 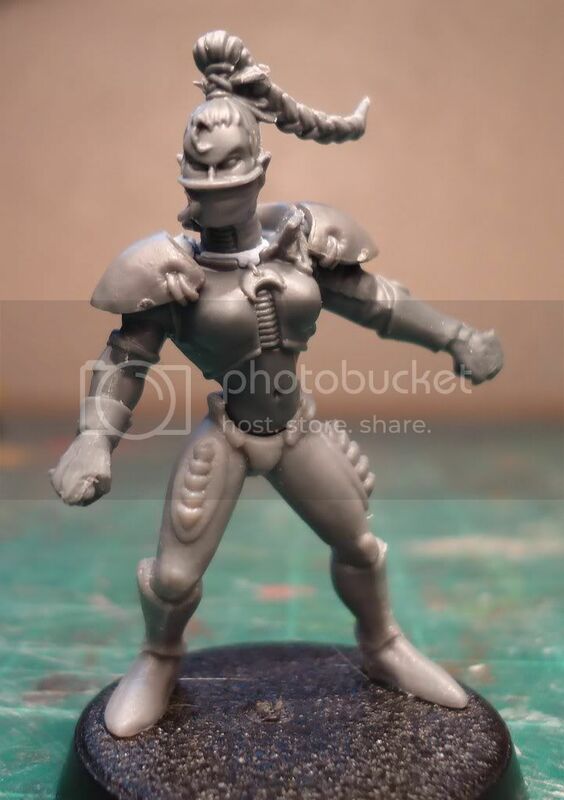 I had seen several conversions using kroot bodies but none of the heads had looked quite right as they mostly used skinks and these were too small. But looking through the tyranid range I saw genestealers had appropriate heads and some even had tongue weapons so with the addition of chaos spawn eyes they could look quite frog like. Below is the test model of a linefrog I built, he still needs quite a bit of greenstuff work done but this should give the idea. I will try and make the Blitzers look more formidable and the catchers more fragile and dynamic. The Broodlord will make an excellent Froggy Kroxigor with some conversion work. I may do the 2 Slann star players even though they are pretty awful and am debating if Lottabottol should be tall with a massive head of hair and purple gooey skin in honour of a certain WILer who has been using the Slann in B lately. Nice job seeing a frog in a genestealer/kroot hybrid. Don't let my feeling for the three crap teams take away from my respect for you artwork. oh man, you're making me jealous. outstanding work! Great work on the chaos pact team. The early slann model isn't working for me, but I'll reserve judgement until you've had a chance to perfect and paint some. As you said, it's still a test model. If it helps, it still looks too bug-like. I have to do a double take to see the frog trying to come out.